George Graham Reviews Tim Blane's "Clockwork"
I think I have lost track of the number of Boston-area singer-songwriters I have featured on this album review series. But the number is substantial. The area certainly has a prolific folk scene, and the performers are very diverse. The abundance of colleges, including Berklee College of Music have made the Boston area a kind of mecca for the music. And this week, we have yet another talented singer-songwriter from the region who has a very worthwhile new CD release. Tim Blane, whose new recording is called Clockwork. Blane attended Berklee, and you can hear that in his musically sophisticated, vaguely jazzy tunes that nevertheless are full of catchy melodies, often funky beats and astute lyrics. He's got an appealing vocal style that owes as much to some soul singers as it does to folkies. His music is acoustic-guitar based, but often gets electric, and keyboards are a prominent part of the arrangements on the CD. In fact, the basic four-piece band is sometimes supplemented by a horn section and other guest musicians. Clockwork is Blane's second album. His debut, called In the Meantime did quite well for a very independent release, selling some 3000 copies. The new CD is being aimed at wider distribution and is being promoted nationally as well. Blane has also been attracting attention winning various regional music awards, and has been touring nationally, opening for artists like Guster, and KT Tunstall. The regular band on Clockwork is a quartet, with Daniel Clarke on keyboards, including such exotica as mellotron and chamberlain; Adam Olenn on bass; and James Williams on drums. They form a tight unit on the CD with the arrangements adjusted to suit the song, rather than its being a rock band who always all play. Most of Blane's songs relate to love in one way or another, but he usually puts a slightly different spin on the subject. Blane's songs don't examine the great issues of the day, and tend to be more clever than profound. But the sum of the music and words makes for appealing listening that doesn't flag on any of the tracks. 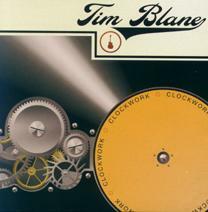 Clockwork, the new second release by Boston-area singer-songwiter Tim Blane is another excellent example of the great music scene in the Boston area. He combines first-rate writing, both musically and lyrically, with a tight band to make music that is a bit more rocky than typical for a singer-songwriter but not hardly standard rock band fare. While Blane does not exactly break any new ground in the ingredients he uses for his music, he does come up with a very appealing mix of influences that in their confluence does represent a distinctive sound. For a sonic grade, we'll charitably give the recording a "B." The mix has good clarity and there is a pleasing absence of studio clutter and low-fi stuff that increasingly afflicts such records these days. Kudos to producers Chris Keup and Stewart Myers. But the recording is excessively compressed, squashing out the differences between loud and soft. Some of the tracks get a bit fatiguing to listen to with that kind of in-your-face, loud-all-the-time sound. There are many hundreds of them on already the scene, but I think there is always room for another good singer-songwriter. Tim Blane is very impressive on his new CD. He creates intelligent, catchy music that does not wear out its welcome with time. Here's hoping he receives the wider recognition he deserves.